October 09, 2014 - "Company News"
Erie, PA --- The Eriez® Metal Loss Monitor brochure is now available for immediate download from the company’s website. 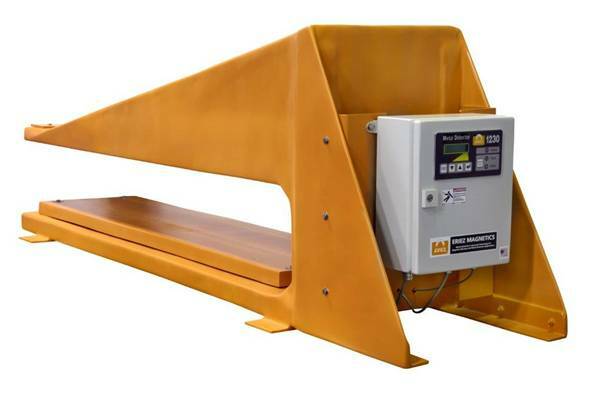 The four-page piece showcases this breakthrough product which continuously scans the residue stream in scrap yards for metal that has escaped the process and is headed for landfill disposal. possibilities for process improvements using trend analysis and statistical process control. It explains that the metal loss data can be instantly visible to anyone, anywhere on the globe via Eriez’ Remote Reporting, whereby text alerts are sent whenever losses rise above a prescribed number. A helpful illustration depicts the locations where the Metal Loss Monitor can be placed in a scrapyard’s process. When positioned upstream to provide hand picking assistance, the optional ink marker system alerts pickers of locations to search for lost metal. When it is placed downstream of pickers before the bunker, it can be used to track pickers’ performance, provide incentives and accurately assess how many pickers are necessary. Metal that passes the monitor produces an alarm signal (horn/beacon) and the event is recorded in a data file. The Metal Loss Monitor brochure includes a complete listing of mechanical and electrical specifications. Optional accessories are also highlighted. To learn more about the innovative Eriez Metal Loss Monitor and download the brochure in PDF format, visit http://en-us.eriez.com/products/metallossmonitor/. Eriez is recognized as world authority in separation technologies. The company’s magnetic lift and separation, metal detection, materials feeding, screening, conveying and controlling equipment have application in the process, metalworking, packaging, plastics, rubber, recycling, mining, aggregate and textile industries. Eriez manufactures and markets these products through 12 international facilities located on six continents.